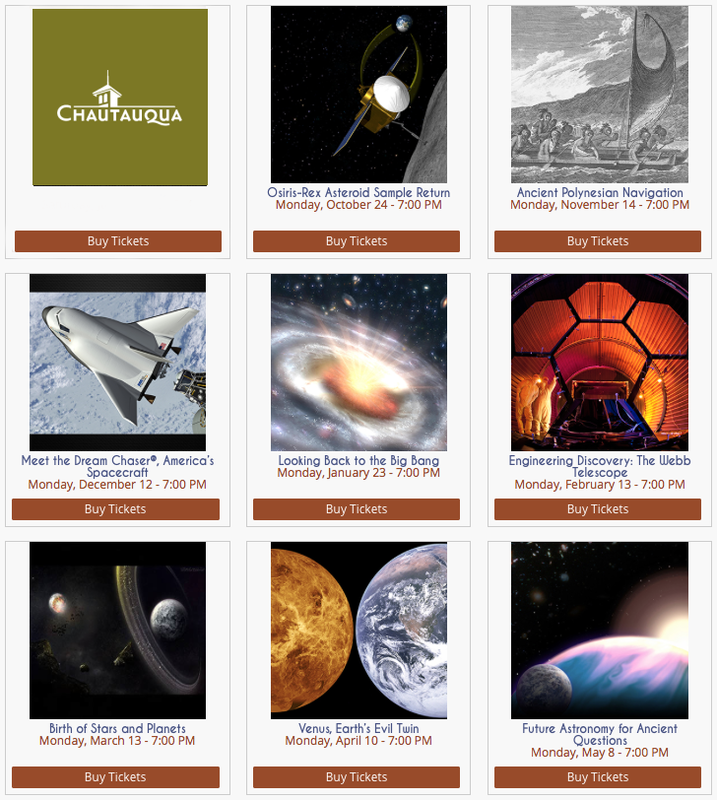 May 2, 2016 – Colorado Chautauqua Association has announced the 2016-17 Chautauqua Space Series, which features some of Boulder’s most accomplished scientists. The public lectures are held at 7:00 p.m. at Chautauqua Community House in Boulder, Colorado. Dr. Vicky Hamilton of Southwest Research Institute all talk about the OSIRIS-REx mission to return a pristine sample from the carbonaceous asteroid Bennu. Clues to the origin and evolution of the solar system, initial stages of planet formation and the source of organic compounds can be gathered from this likely carbon-rich sample. Join Dr. John Stocke of CU Boulder to learn about the ancient navigational techniques that modern explorers use to recreate the ancient ways, while reviving their Polynesian culture and heritage. The development team from Sierra Nevada Corporation’s (SNC) Space Systems, the owner and integrator of the Dream Chaser, will discuss the Dream Chaser’s upcoming missions and future implications. Nils Halverson, Ph.D., is an Associate Professor in the Astrophysical & Planetary Sciences and Physics departments at the University of Colorado, Boulder. He has spent the last 20 years building and deploying Cosmic Microwave Background (CMB) experiments. He is currently collaborating on projects with telescopes at the South Pole, in Chile, and possibly in space. Allison Barto, Ball Aerospace, is the program manager for the James Webb telescope and will lead Ball’s support during launch and commissioning, scheduled for 2018. She will share how astronomer’s questions shape telescope design and offer a glimpse into the amazing engineering that enables scientific discovery. Dr. John Bally, APS, Boulder, is on the Spitzer space observatory warm mission which monitors approximately 200 nearby galaxies for luminous infrared flares. He will discuss the formation of stars and planetary systems and share incredible results from the new ALMA telescope in Chile. Dr. Larry Esposito of LASP & APS will discuss the similarities between Venus and Earth and study the links between the surface, interior and climatic processes that reinforce the idea that Venus could represent the fate of Earth – making Venus an essential target for further exploration. Dr. Makenzie Lystrup, Ball Aerospace, will share a glimpse into the future of astronomy and aerospace technology. Ball Aerospace has been advancing space technology for over 60 years, but it is the next generation of cutting-edge technology that will shed light on the age-old questions of life beyond Earth. TICKET INFORMATION – Tickets now on sale! These shows sell out fast! May is not too early to plan for October.